My kids are really good eaters, but as they get older, they are out on their own more and they sometimes forget to eat vegetables! So now when they are home, whatever meal we’re eating, I try to pack it as full of as many veggies as I can. Here is a meal we had a few weeks ago after a sleepover-playdate combination involved pizza, pancakes, and very little sleep…I literally went through my fridge and put every vegetable I could find in this meal and it was super yummy! 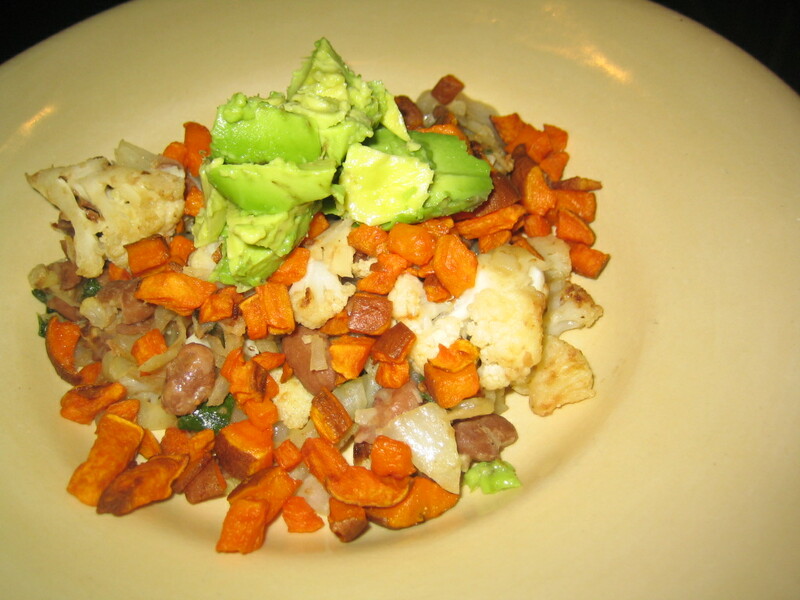 We love roasted vegetables, so I roasted the sweet potatoes and added them later. You could do the same with carrots, but you could also stick them in the saute after the onions are caramelized, which is how I’ll write the recipe for simplicity…I also sauteed some millet cubes separately to crisp them up, but again, you always have the option to keep it even more simple! Heat a large saute pan to just below medium, add the onions and drizzle with olive oil and salt. Give them a stir, then let them cook while you prepare your other vegetables. After about 15 minutes, add the carrots and continue to cook until both the onions and the carrots are soft and starting to brown lightly, 5-10 minutes. Clear some space in the pan and add a little more olive oil and the cauliflower. Sprinkle with salt and allow to cook undisturbed for about 5 minutes. Add the cabbage and greens and cook until they start to wilt. Add the pinto beans and cook until heated through. Season to taste and serve over grains, if desired. Top with avocado cubes sprinkled with a little salt and lime if you have it. Enjoy! I can’t stop thinking of new menu items for my cafe. I was having a conversation with my lovely baker about the possibility of doing kids’ lunches and we were brainstorming foods that might work particularly well for school lunches. You know, easy to eat, healthy, familiar enough for most kids…She mentioned that a restaurant she once worked in served a hummus pizza and I have been obsessing all of the hummus pizza possibilities since then. As you know, I’m also obsessed with Za’atar. On top of all of that, I have gotten over my longstanding aversion to olives. I think we just might have it on the menu at the cafe sometime soon…this may or may not be the version that goes into kids’ lunches, but it sure is yummy! If you are using a pre-baked crust, preheat your oven to 375 degrees. If your crust still needs to be cooked, bump it up to 400 degrees. Place your crust on a pan and spread with hummus. Arrange the broccoli, onions, and olives (if using) evenly over the hummus. Sprinkle with sumac, fresh thyme, sesame seeds, and sea salt. Add a pinch of aleppo pepper, if you wish. Bake for about 10 minutes, or until your crust is lightly browned and the hummus is heated through. Enjoy! I plan to get back to the regular recipe routine in a few weeks, but for now, I want to invite you to a sneak preview of Julia’s Kitchen this week. We still have some work to do, but I have missed making soup! Plus, what better way to figure out how to run this thing than to invite you all to come in while it’s a work in progress?? The address is 4457 Broadway. The cafe is set back and a little tricky to see from the street when you are coming up North on Broadway. We are on the West side of Broadway just North of Violet, in a little strip of stores – if you are familiar with North Boulder Cafe, we’re in that same strip. There are two entrances to the parking lot, so it you miss the first, just take the next one! We don’t have a sign yet, but the cafe is painted white with brown trim. If all that hasn’t all scared you off, I would love to see some friendly faces there before our grand opening! As the week goes on, we’ll add scones, brownies, sautes, dips, and more! I am so excited and I hope to see you there!